Two of Japan’s elite chefs are headed to Honolulu, offering a week of superior dining featuring signature Japanese-Peruvian fare and Haute-Chinese cuisine. Chef Nobu Matsuhisa is returning to his Hawaii flagship restaurant, Nobu Waikiki, with friend and acclaimed culinary master Chef Yuji Wakiya, from April 20–24, 2011. On Thursday, April 21, 2011, chefs Nobu and Wakiya will partner with Halekulani’s executive chef, Vikram Garg, in the beneficiary culinary event, “For Japan,” which sold out in mere hours of its announcement. On Friday, April 22 and Saturday, April 23, chefs Nobu and Wakiya will return to the kitchen of Nobu Waikiki to offer an exclusive collaborative omakase at $150 per person. Chef cookbooks will also be available for purchase and personal autographs. Reservations strongly recommended at (808) 237-6999 or at Open Table. ‘Sado Blossom’ – Nobu sorbet with Nobu Soju, hibiscus-infused simple syrup, yuzu juice shisho leaf and mint. ‘British Raj’ – Bombay sapphire gin, kafir limeade juice, topped with sweet curry and apricot infusion. 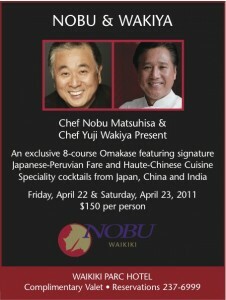 Follow Nobu Waikiki happenings on Twitter at @NobuWaikiki or on Facebook.